The best thing by far about the weather turning a lot colder and miserable is the fact it is a perfect excuse for a cosy night in. I have these far too often but you really can't go wrong with getting in from work and just switching off and relaxing. So here are a few of my essentials for a perfect night in.. The first thing I do when I get in from work is get changed. If it isn't too cold I will throw on a pair of shorts and a football shirt. 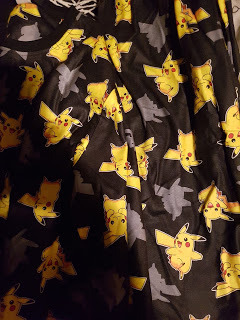 If it is cold I will throw on my pyjamas, my favourite at the moment are the mens character ones especially the Pikachu ones in the image above. To me the thick the pyjama the better. I will also usually throw on my dressing gown just to add a little extra warmth. Good snacks are perfect for nights in where you are just sat watching the TV. I usually have some Doritos or chocolate to keep me going but this will be getting a healthier choice thrown in soon. Drink wise I do drink a lot of water which continues on those nights in, however I am starting to love the Nescafe Azera Americano so that is being drunk a lot lately. If I fancy something a little stronger I end up reaching for a Gin and Tonic or Whisky lately. A good film is a most however my love for YouTube has really made a comeback lately and my subscription list is forever growing so I spend most nights in catching up on that. I usually have my laptop next to me during this as well so whilst watching I can catch up on my Twitter and Instagram. Most nights I also turn on the PS4 or Xbox and have a little gaming session if it has been an easy day at work I will usually play something a little challenging but if it has been a hard day I will end up on my usual Fifa. So those are a few things that make up my perfect night in. What are yours?